First the minor complaint. In the booklet, the track-listing is printed in light brown ink on a mottled dark brown background and is well nigh unreadable. Even when the colours are reversed on the jewel-case insert the information isn�t the easiest of reading. More positively, and more importantly, there is a lot of striking music here, played with conviction, certainty of purpose and considerable subtlety by the Duo Gelland. All the composers are � like the performers � Swedish. It is clear from the documentation provided that the Duo Gelland have worked regularly with the composers. This is apparent in the evident understanding and sympathy that characterises these performances. 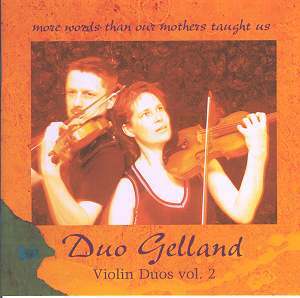 Indeed, it is clear that the Duo Gelland have themselves done much to encourage the creation of this repertoire. Both parties � performers and composers � have certainly benefited from this interaction. So does the third party made up of listeners. Erik F�rare�s teachers have included Gunnar Bucht and Brian Ferneyhough. He describes his Duo No.2 rather delightfully: �Duo nr. 2 comes out of my long time dream to create a direct and spontaneous piece of musician�s music. Nonetheless its character is philosophical. Perhaps this work is an example of what I would like to call fiddlers� philosophy�. Certainly it is a closely argued piece that yet has an air of freedom and intuition about it. In three movements, its central �allegro fluente� is perhaps the most striking, its juxtaposition of one melodic line played in the upper piccola register with another played sul ponticello intriguing and witty. Hakan Larsson also has a reputation as a jazz guitarist; in the classical sphere his works include two symphonies, two violin concertos and a number of works for chamber ensemble as well as three double concertos for two violins and orchestra. The piece recorded here is apparently a kind of pendant to one of these double concertos, itself commissioned by Duo Gelland. In his duo�s title � which can perhaps be translated as �Naught becomes all� � the composer intends an allusion to the famous verse from Corinthians: �For now we see through a glass darkly, but then face to face: now I know in part; but then shall I know even as also I am known�. The voices of the two violins act out a poignant drama of unfulfilled aspiration to unity, of familiarity never quite fulfilled, union never quite achieved; yet their interaction seems to carry the promise there will come a time of full communion. The playing of the Duo Gelland is particularly fine here. The Largo by Ingvar Karkoff - son of the fine composer Maurice Karkoff - is a meditative, mysterious piece which is melancholy, even lamentational in mood; its gestures are not big or dramatic and the sense of silence and space around the intimate sound of the two violins is an important part of its effect. A quietly impressive work, which it one cannot imagine receiving better performances than the one it gets here. Karkoff, incidentally, is another who studied with Ferneyhough during his time as Visiting Professor at the Royal College of Music, University of Stockholm. Kerstin Jeppsson - who studied with Maurice Karkoff - speaks of the three movements of her Canto crom�tico in imagery which relates it to the renewal of life in spring and summer, especially as reflected in garden birds and their song. But this is neither a piece of cosily whimsical onomatopoeia nor a Messiaen-like study. It is not in the actual sounds of bird-song that Jeppsson deals, so much as with deeper structures, with natural rhythms that lie outside the codes and structures of human music, yet must somehow be accommodated within them if we are to make them part of the art�s representation of the world we occupy. This is an interesting, sophisticated piece, in which I have found more with each hearing. A cellist by training, Peter Schuback�s work as a composer has encompassed many genres and instrumental groupings, mostly in the field of chamber music, though he has also written an opera (Ku) and three cello concertos. An earlier recording on nosag (nosag 067) is made up of improvisations with the pianist Davor Kajfes. Del altro al altro is preoccupied with echoes and reflections, of ideas exchanged between the two violins, of material given and taken and given again. I found it the hardest going of the pieces here, but I am getting more from it on later listenings. This is a finely recorded CD, full of music which rewards attentive listening in ways that aren�t always predictable. It confirmed the good impression - admittedly based on very limited evidence - of one or two of these composers, and made me want to hear more by those whose work was new to me. I hope that both the Duo Gelland and nosag will be able to keep up the good work. I note with gratitude that production of the CD was supported by the Swedish National Council for Cultural Affairs and the Swedish Arts and Grants Committee. I hope that they will keep up the good work, too.